Christine Tomori and Janet Beavin Bavelas have micro-analyzed conversations of four distinguished therapists, client-centered therapists Carl Rogers, and Nathanial Raskin and solution-focused therapists Steve de Shazer and Insoo Kim Berg (read their article). Micro-analysis is interesting because it does not focus on the theories or assumptions behind models but it shows you what practitioners actually do in conversations with their clients. One of the things Tomori and Bavelas compared is the occurance of negative and positive expressions by the four therapists. 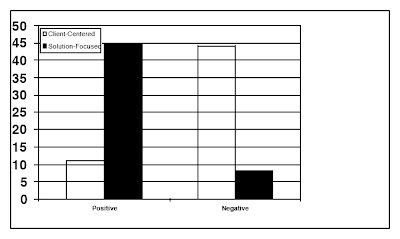 They found the solution-focused therapists use much more positive and much less negative expressions (see figure below and click on table above left for details). John Gottman's work is extremely impressive. If his sort of results on interaction ratios generallize this widely, this probably has a lot of implications. But I'm not quite sure of what! The whole point of microanalysis of behavior is to strip off the theory as far as possible, but then you have to at some point go back and try to explain why you're getting the patterns! That is, at least when you want to generalize it to other areas. You still need a plausible causal model in order to argue for changing people's behavior, I think. At least I'd be a lot more comfortable with one. The interesting thing I found here was that the SF therapist did not deliberatedly try to establish the 5:1 ratio but still realized it. I agree with what yo usay about stripping off theory but still needing to make some generalizations in the end. I think that is well said. There's of course the matter of cause and effect, which I think you allude to by your interest in the 5:1 ratio appearing unbidden. Should we try to create that ratio, or is it the result of doing other things right? It could of course be both. It may not be neccessary, but still useful to deliberate move toward the ratio in order to produce it? Empirical question. In this case, they noticed the ratio without attempting to create it, and I think I remember Gottman and others deliberately trying to approach it, and having some apparent success as a result. I'm only superficially familiar with Fredrickson as one of the leading researchers in "positive emotions." I think that's a great field with a lot of useful findings, so long as we remain aware that these are not supertraits. Positive traits have a downside as well as an upside, and I think the same is true of positive emotions. Learning deception is part of developing social intelligence and identity sense. Blind devotion to fairness derails relationships. Empathy is used by many people to manipulate. Felons tend to have higher than average emotional intelligence. Prosocial emotions are also the motivator for us vs. them conflict between groups. Etc..
And resilience, which is essential to thriving under highly variable conditions, absolutely requires negative as well as positive experience to build upon. Just my current thinking. I go way back to Aristotle's concept of virtues for inspiration on how to think of this. Each virtue is important, but we optimally should cultivate a balance of different amounts of different virtues for adaptation to different environments. The overall process, Aristotle thought of as the master virtue of "prudence," is pretty close to what I think of as wisdom. Do you think I need to look more into Frederickson's work? Hello Todd, interesting comment, thank you. I very much like what you say about positive psychology and I fully agree with everything. Another example is self-esteem . I am enthusiastic about PP's mission (finding out how individuals and collectives thrive) and about its focus on research but not too much with the strong focus on individual traits. Here is my view on PP: I think its focus is probably too individualistic and we'd do well to move into a more interactive, dynamic and situationalist perspective. Instead of focusing on strengths I think we should focus more on what (whatever) works. From a SF perspective, it shouldn't matter if the ratio is deliberately strived for or arises naturally. It's the external process that counts. Doing it naturally would probably feel more natural, but that would come with practice. WRT "self-esteem" and other PP concepts, the research seems to find that focusing directly on developing self-esteem is counter-productive. Apparently self-esteem is a by-product of other actions, like focusing on developing competencies, helping others, etc. "I think its focus is probably too individualistic and we'd do well to move into a more interactive, dynamic and situationalist perspective. Instead of focusing on strengths I think we should focus more on what (whatever) works." Jim,good point on self-esteem. I went for the self-esteem movement in a big way for a few years, but began to suspect problems with it for number of reasons. The biggest reason was that I noticed that some of the worst bullies didn't lack self-esteem as the theory claimed, they were loaded with it. I suspected there were other problems. When I read Roy Baumeister's negative review article on the research that supposedly supported the unambiguous value of positive self-esteem, it helped me fill in the pieces. I agree that research since then seems to have reinforced the idea that self-esteem is either something that has an optimal point for an environment, or should be better treated as an artifact of other things rather than a central motivational concern on its own. Thanks for the article, Coert, her use of NLD to model traits is pretty interesting.